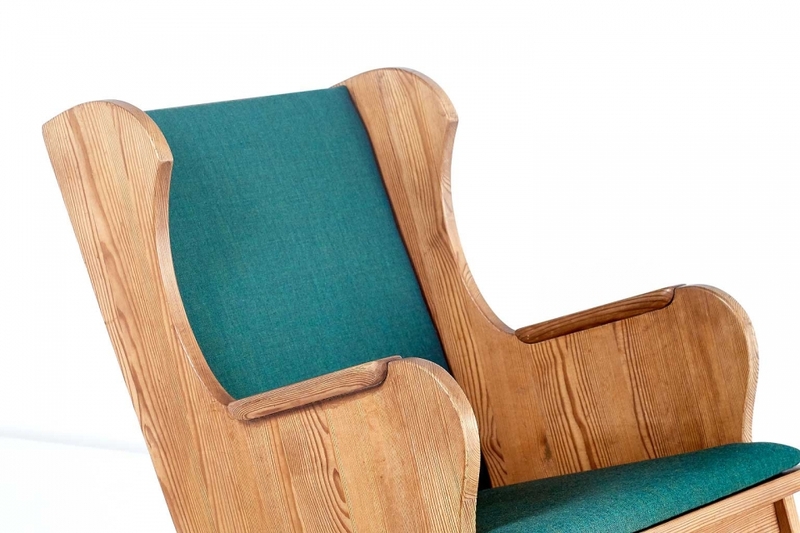 This rare rocking chair is part of the ‘Lovö’ series designed by Axel Einar Hjorth for the high-end Stockholm-based Nordiska Kompaniet department store in 1932. Executed in pinewood, this chair offers a particularly striking woodgrain. The original loose cushions have new been fully reconditioned and newly upholstered in a green Kvadrat ‘Remix’ wool fabric. The designs of Hjorth’s pinewood furniture for NK were closely connected to broader social and cultural changes in Sweden at the time. From 1929 onwards, a new focus on health and leisure led to the official instalment of paid holiday leave by the Swedish government, which made it possible for more and more people to acquire a summerhouse. The ‘Sportstugemobler’ line by Axel Einar Hjorth unified these modern ideas of leisure with the aesthetics of traditional Provincial life. With his highly original strand of Primitive modernism, Hjorth was able to combine a farmhouse simplicity with a functional, modernist idiom. Executed in simple basic materials such as pinewood and solid oak, the designs were often named after the islands of the Stockholm archipelago, such as Blidö, Sandhamn, Toro and Lovö. Condition: very good. The cushions have been reconditioned and newly upholstered in a green Kvadrat Remix wool fabric.